Removing stubborn soils can be challenging. Oil, grease, gels, wax, dyes, flux, emulsifiers and biological debris are just some of the soils that are difficult to get rid of. It can be a daunting task to find a cleaner powerful enough to remove these soils, and is also non-hazardous and environmentally friendly. Micro-90 is a mild, yet powerful, multi-purpose, formulated cleaner that is effective in both industrial and critical cleaning applications. This unique detergent contains chelants and anionic and nonionic ingredients which combine to produce a variety of cleaning actions. 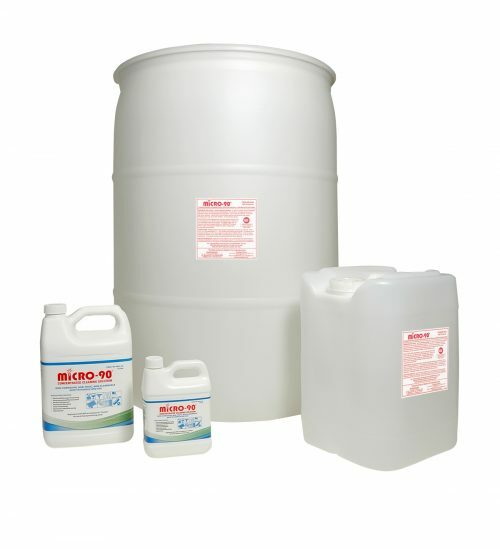 Micro-90 lifts, disperses, emulsifies, sequesters, suspends, and decomposes soils. Once rinsed away, surfaces are thoroughly clean without any residue. Micro-90 is designed for a wide range of applications. It can be used to remove oil, grease, resin, tar, wax, biological material, insoluble oxides, gels, dyes, fine particles, flux, emulsifiers and many other soils. Micro-90 is excellent at cleaning metal, glass, ceramic, rubber, plastic, gemstones, filter membranes and most other hard surfaces. International Products Corporation (IPC), the manufacturer of Micro-90, demonstrates the effectiveness of Micro-90 in this video. In the video you can watch as Micro-90 removes heavy soil build-up from ceramic tiles and metal surfaces. Soils shown in this example include simulated bathroom grease and oil, baked on kitchen grease and mineral-based soils. A 2% concentration of Micro-90 in water is all that is needed to remove dirt and restore cleanliness to surfaces. You can actually watch dirt lifting off the objects and when finished, they look just like new! See for yourself! 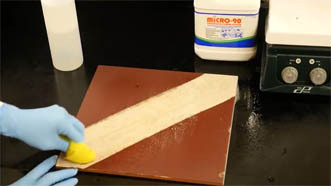 Request a free sample and put Micro-90 to the test for your most challenging cleaning applications. Interested in learning more about Micro-90? Visit IPC’s website or contact one of our technical specialists.